You can quickly see which employees’ emails do not have any notifications set up on the Employees page (they are marked with “None” and highlighted yellow). If the email column is not visible, click the “Select Columns” in the upper left to add that column to the display. “None” Emails – This indicates that there are not yet any email notifications set up for that email. 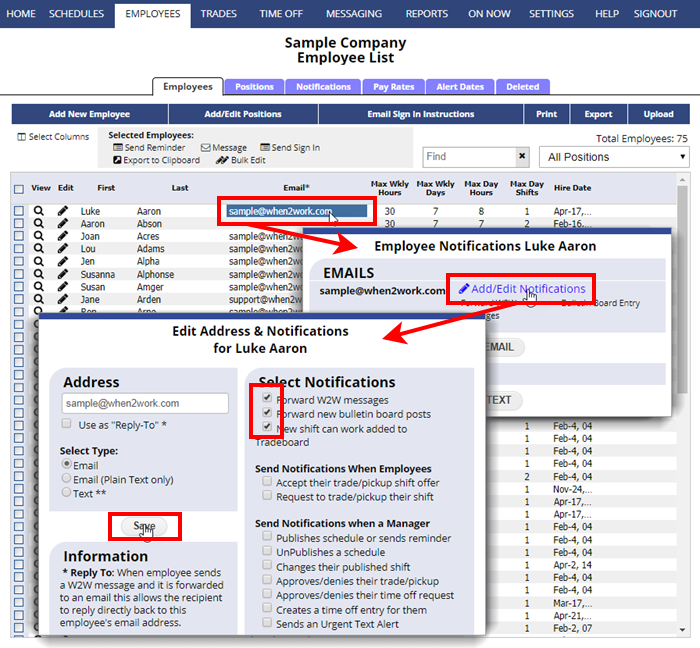 Click the cell and then click to Select which notifications are sent, or notify the employee and ask them to choose which notifications they want to receive at that email address. Changes to Published Schedules – Normally when you make changes to published schedules notices are sent out to the affected employees. You can uncheck the box in the Shift Change window (or on the Schedule View page you are working on) to prevent these notices from being sent.